Chandler O'Leary: " My work is detailed, layered, labor-intensive, painstakingly researched, graphic in style, and often evocative of a strong sense of place. My design approach usually begins with historical research, to create a connection to the past and reinforce current relevance. Drawing is a major component of both my process and my finished work; mark-making brings evidence of the hand in direct relation with the conceptual components of each piece. My projects often develop in the form of a series, and build a narrative through sequential imagery." Tacoma, Washington: Anagram Press, 2015. Edition of 50. 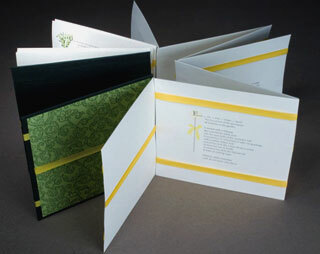 7 x 9" closed, extends to 15 feet; 20 pages including pastedowns. Accordion structure. Digitally printed from watercolor illustrations on archival, 100% cotton paper. Handbound paper over boards. In paper slipcase. Signed by both artists and numbered. 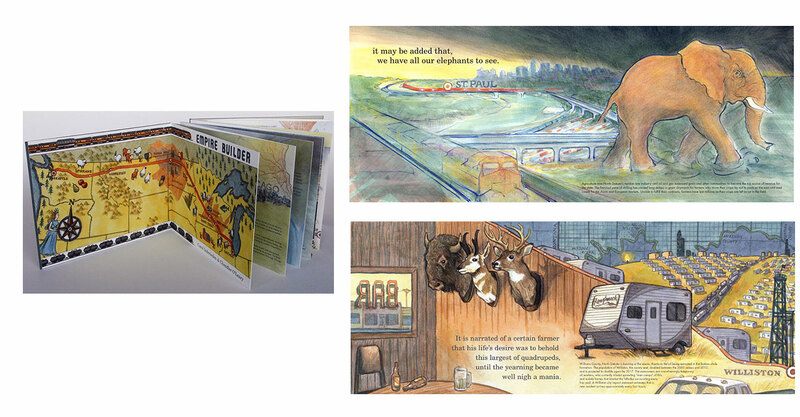 Empire Builder is a collaboration between artists Carol Inderieden and Chandler O'Leary; both contributed text and illustrations. The two artists lament the changes they have seen in the American West, changes driven by the thirst for oil and natural gas, changes spawned by fracking in North Dakota and ending in oil refineries of Washington. It is the story of tunnel vision and the attendant environmental consequences. The book "reads like a map – tracing both the route of the Empire Builder train and the path of industry and destruction, in one long, unbroken line." "If the American map were the Elephant writ large, it is the railroad that breathes life into the creature. Throughout the last century of rail development, the anatomical structure of a complex organism has evolved. Today spurs and trunk lines follow a vascular system that carries a lifeblood of raw materials across the nation in a never-ending stream of freight. While the Elephant’s lungs fill with natural gas, its veins run gold with domestic oil and its heart beats ever faster in the Bakken Formation of western North Dakota. "The backbone of the modern Elephant is the railroad line from Chicago to Seattle — incidentally, the same line that carries the Empire Builder passenger train. This train is aptly named for the exploits of James J. Hill, the railroad lumber baron who grew rich transporting timber and other raw materials from the Pacific Northwest to the cities and industries of the Midwest. Today one can ride the Empire Builder from one end of Hill’s domain to the other, and witness every element of the fracking process along the way. In the early 20th century, the Empire Builder encouraged travelers to 'See America First' and marvel at the wonders of the natural world speeding past their windows. Today’s rail passengers watch the new Industrial Revolution rolling by. "This book is an attempt to articulate our dismay at the rapid transformation of a West we know and remember. We live and work at opposite ends of the Empire Builder railroad line: Carol in the Driftless Region of Wisconsin, where the bluffs and hillsides are being strip mined for frac sand; and Chandler in the Puget Sound area of western Washington, where Bakken oil is refined and shipped to other ports by tanker vessel. We both have personal ties to the northern Plains, though recent events render the region unrecognizable when compared to our memories. Still, the railroad connects us to each other and the landscapes we love. For the pioneers of the new era, the rhythm of the railroad is the marching song of progress — but for us, it is a lament." Tacoma, Washington: Anagram Press, 2013. Edition of 57. 7.5 x 5.75"; 13 cards. Letterpress printed and individually hand-painted. Housed in a saddlebag envelope with hand stitching along the seams and edges. A herd of twelve steeds corralled in a paper saddle-bag. 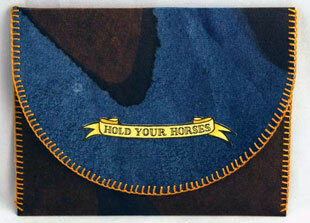 Chandler O'Leary, Colophon: "I am not a member of the horsey set. I grew up far too poor for riding lessons, and I can't claim ever to have used the phrase 'saddle up' in the literal sense. Yet horses are as much a part of me as of any American who ever looked westward in wonder. They are living symbols of the wildness that still infuses our deepest desires - even if they no longer permeate our everyday culture. "I never had a pony as a child, but now I can boast a round dozen. 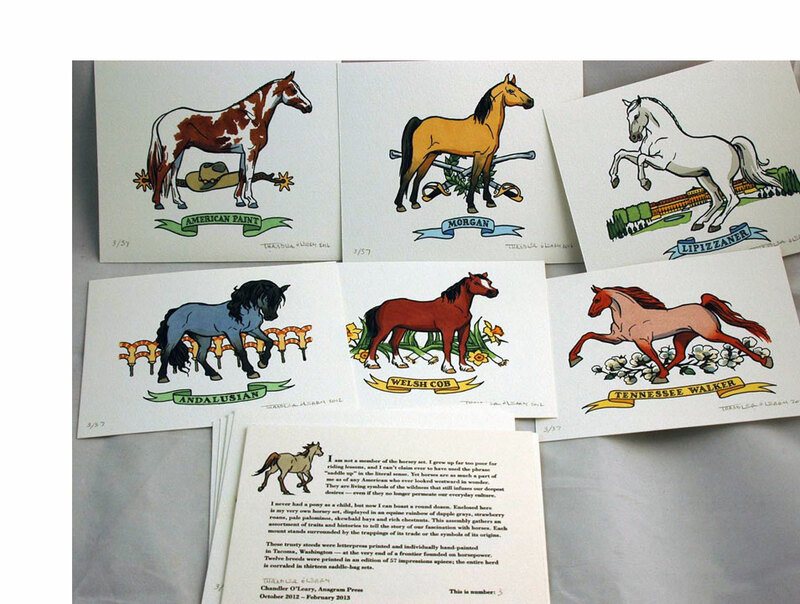 Enclosed here is my very own horsey set, displayed in an equine rainbow of dapple grays, strawberry roans, pale palominos, skewbald bays, and rich chestnuts. This assembly gathers an assortment of traits and histories to tell the story of our fascination with horses. Each mount stands surrounded by the trappings of its trade or the symbols of its origins." Minneapolis, Minnesota: Anagram Press, 2006. Deluxe Edition of 30. 7 x 7"; 32 pages. Letterpress printed using Optima and Bodoni type on Stonehenge and Tizano paper. Jacob's Ladder binding. Housed in a nested box. 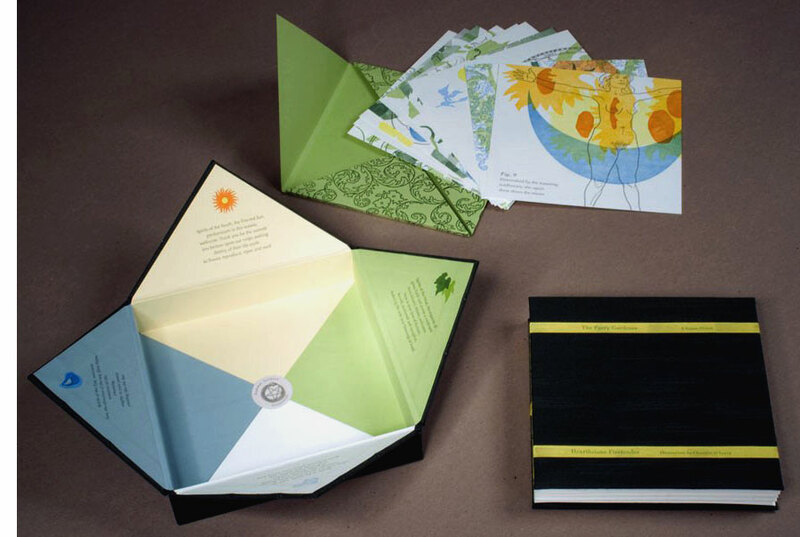 Includes packet of original illustrations by Chandler O'Leary printed in layers from photopolymer plates. Anagram Press: "Hearthstone Firetender's poetry tells the tale of modern witchcraft set in a Maine community garden; an overview of pagan spirituality (complete with gardening tips) conveyed through a story of growing kinship with a secret admirer." Illustrations: "Informed by photographs by Michael O'Leary, 2004-2005, using Leica Digilux I, a 1974 Yashica TL-Electro (minus the -electro function) and Uncle Sean's old Kodak Advantix, except where noted in a previous incarnation: by Scott MacDonald, 2004." 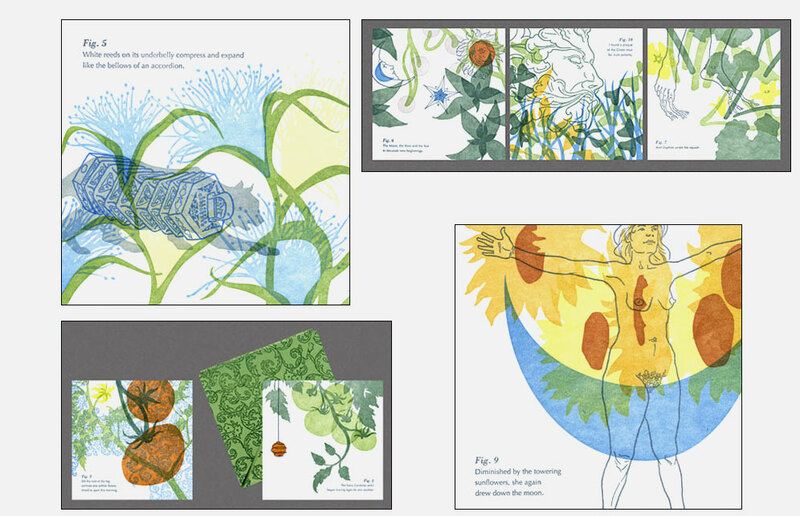 "Included also is a packet of original illustrations....Inspiration runs the gamut from wallpaper fragments in the Open Book building in Minneapolis; my old art history notes; a conversation in a basement studio at Colorado College; reruns on Nick at Nite; and a hurried drawing in my sketchbook of a Bernini in the Galleria Borghese." Tacoma, Washington: Anagram Press, 2010. Edition of 26. 10 x 8 x 8" box construction. Includes 3 drawers with ribbon tab pulls, 120 illustrated image flats, removable viewing box, and 50-page stab-bound Locator Key pamphlet. Outer wrapper with bone clasp enclosure. An edition of 26 Arabic-numbered books and 4 roman-numbered artist proofs. 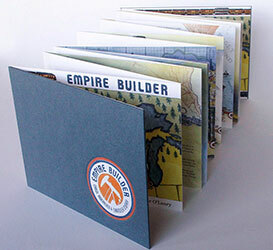 An interactive artist book, capturing the changing faces of Mt. Rainier. Illustrated and compiled from data collected in person, on location, from 2008 to 2010. 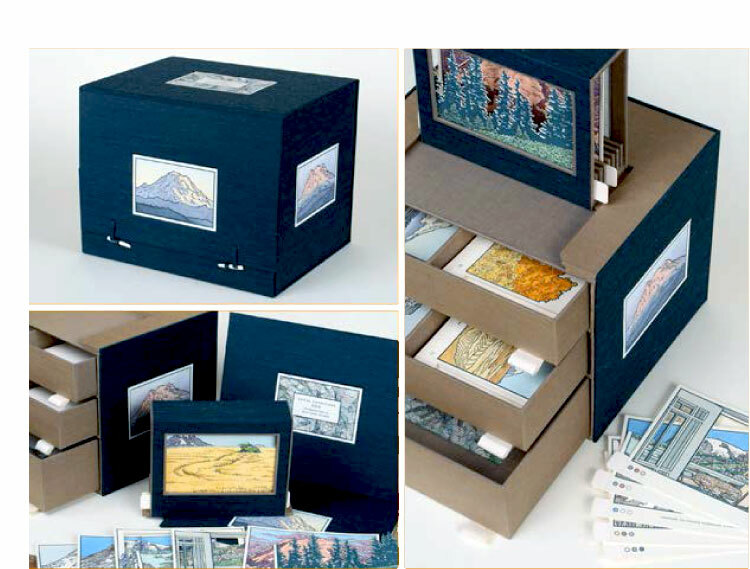 Letterpress printed, hand-watercolored, housed in a set of drawers with nested stab-bound book and Japanese-style outer wrapper. 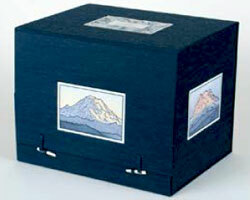 When the book is fully closed, it resembles a cube; the faces of the closed book contain illustrated labels corresponding to the North, South, East and West faces of Mt. Rainier, each depicting the mountain at sunset. The frontispiece containing the title of the book is at the top of the closed wrapper, and depicts a topographic map of the summit of Mt. Rainier. In homage to the color palette of Katsushika Hokusai’s Mt. Fuji series, all text and images are letterpress printed in indigo ink. 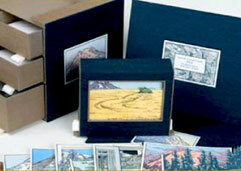 Images and topographic map patterns are hand-drawn and watercolored; image flats are hand-cut. 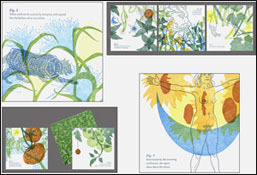 The book contains 120 image flats and a viewing box; by combining and layering the flats inside the viewing box, the reader can create literally millions of scenes. The book details 100 views documented by the artist, but it is possible for the viewer to create up to 1.4 quintillion unique image combinations. Each image flat is numbered and printed with an individual color code for use in creating the 100 defined views, which are detailed inside a nested stab-bound Locator Key. Real-time data for the color-coded 100 views are documented here, including date, time, latitude and longitude coordinates, location name, weather data, and notable historical information. Color code instructions are printed inside the outer wrapper; Key also contains numerical "recipes" for the flats required for each view, should the viewer choose to start with the Key rather than the flats to create scenes. "Japanese artist Katsushika Hokusai (1759 – 1849) is perhaps best known for his seminal works, Thirty-Six Views of Mount Fuji and One Hundred Views of Mt. Fuji. The two series of woodblock prints, published from 1829 to circa 1847, depict the sacred peak within the context of landscapes and scenes of daily life. At the heart of the series is Hokusai’s own obsession with immortality, and his fascination with Fuji’s eternal presence. "Therein lies the rub: Fuji is anything but eternal. Beyond the usual, abstract geologic transience of eroding rock and drifting continents, Fuji is an active stratovolcano. Its days—and those of the lives and lands at its base—are numbered. "Here in Washington state, just forty miles southeast of my home, lies Fuji’s taller, more volatile, American twin. Variously named Tacobet, Tahoma and Ti’Swaq’, among others, by the region’s indigenous peoples, or simply “The Mountain” by contemporary locals—its most arbitrary moniker, coined in 1792 by Captain George Vancouver, is the one that stuck: Mount Rainier. "It’s easy to forget Rainier’s impermanence. It has presided over thousands of years of indigenous culture, followed by the encroachment and permanent occupation of white settlers. It oversaw the construction of the Northern Pacific Railroad, the fever of the Klondike Gold Rush, the splendor of the Alaska-Yukon-Pacific Exposition. It stood in judgment while the American descendants of Hokusai’s countrymen were imprisoned beside the wooden-frame rollercoaster of the Western Washington Fairgrounds, at the internment center nicknamed Camp Harmony. And it has watched the rise and decline and rise again of Tacoma, the City of Destiny lovingly misnamed in its honor. "Yet all the while, Rainier has changed as much as the tableau at its feet. Its volcanic restlessness shifts its form, as our capricious Northwestern weather masks its appearance. It hides, or dominates, depending on the time of day or year. Even we have proved a catalyst, as our warming climate chases its alpine glaciers into retreat at the speed of industry. "And one day—whether tomorrow or in a million years, in an explosion of ash or by the erosion of time—Mount Rainier will disappear completely. I can’t begin to predict the future, but I can attempt to capture the present moment. One hundred present moments, to be exact. If nothing else, Local Conditions is a reminder of the lesson of this place: that here in the Ring of Fire, we never see the same Mountain twice."